Worksheets, illustrations, and tools at the end of each chapter lead you to a better awareness of how different components in your life affect your situation. There is no reason any person, including yourself, should live without hope. Find the path that leads to your ideal future with the life lessons in Changing Your Equation. 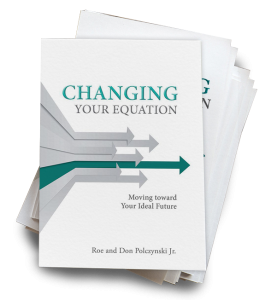 Preview the Book Preview excerpts from Changing Your Equation and get a sneak peek of what you can learn from this leadership guide. Stay Connected We want to stay in contact with you throughout the year, sharing thoughts and ideas on how you can continue your journey toward your ideal future. Free Download Start your journey today with a FREE, downloadable Dream Day guide from Roe and Don. Book Tools When you read our book, follow along with these helpful tools.